The information will allow the proactive Board of Directors to prepare a reasonable budget now and anticipate future needs over time. “Our company takes pride in being an integrated lake and pond management company that provides the full range of services and products needed by lake, pond and stormwater device owners. 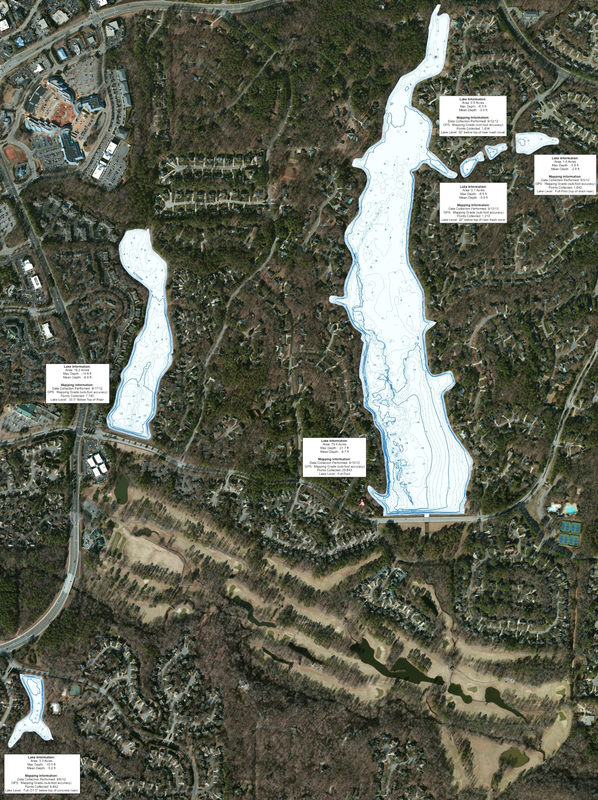 We see our partnership with The Mapping Network furthering our commitment to be the most cost effective lake management company in North Carolina and surrounding areas” says Foster. This map shows water depth contour lines for all six bodies of water. These detailed lake maps will be used for future lake management planning and as fishing maps for the community. Foster Lake Management surveyed the coves to calculate sediment volume. Each cove had a total sediment volume along with sediment thickness noted on the map. The community is able to easily locate sediment problem areas and take appropriate measures to manage these areas. The Mapping Network is an industry leader in Geographic Information Systems Consulting, Data Conversion, and GPS Data Collection. We specialize in terrain and sub-surface (bathymetry) GPS mapping by accurately mapping bodies of water, calculating the water volume, collecting sediment depth samples at critical areas and monitoring the distribution of sediment over time. We have a nationwide group of professionals specializing in all facets of lake management. 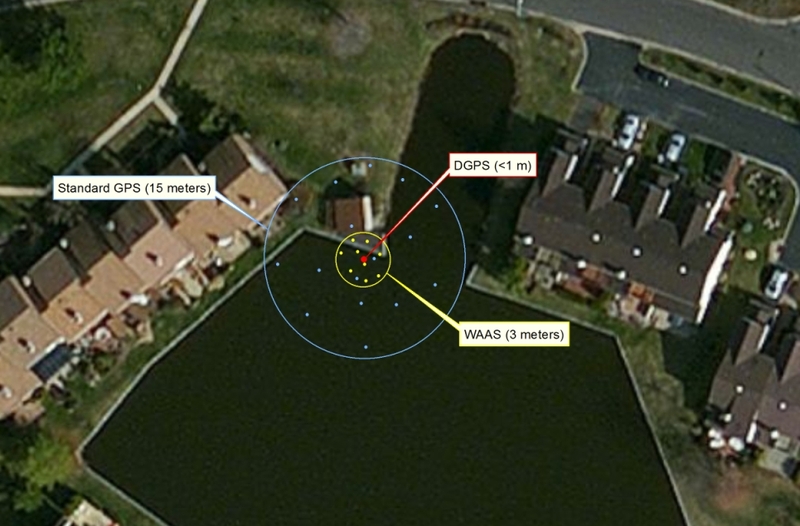 If you are serious about maintaining a high-quality golf course, lake or pond, be sure you have the ability to make the best decisions, get your resource mapped by the professionals at The Mapping Network. Give us a call or send an e-mail to find out more details. 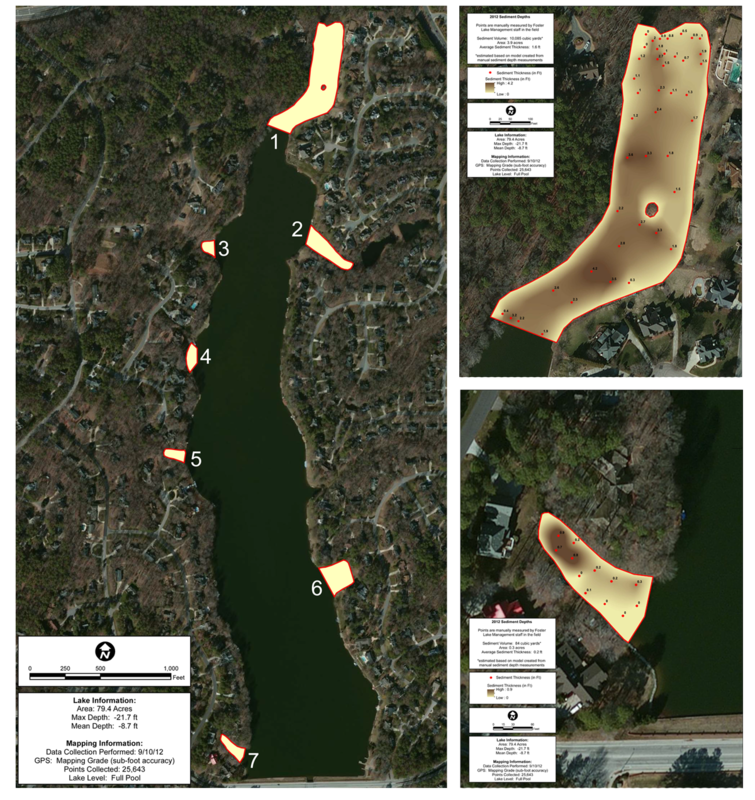 This entry was posted in Lake Map, Sediment and tagged aerial lake map, Aerial Map, Bathymetric Map, Bathymetry, Dredging, Fishing, foster lake management, GPS, GPS Lake, GPS Map, Habitat, hydorgaphic survey, hydrography, Lake Management, Lake Map, Lake Mapping, Lake Survey, north carolina hydrographic survey, North Carolina lake map, Sediment, Sedimentation, Survey, texas fishing, Texas Lake Map, Texas Map, The Mapping Network, Waterfowl on October 16, 2012 by Moderator.